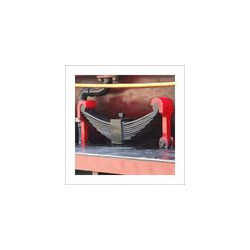 We offer Leaf Springs Exporter that exerts some type of load or force when it is compressed. 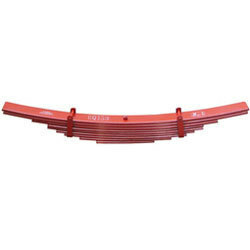 Leaf springs are manufactured from quality material that make them highly durable and long lasting. 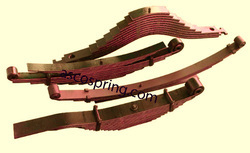 Leaf Spring is available in different shapes like cylindrical, conical, barrel shaped, hour glass shaped and concave. Moreover, our range is offered at industry leading price. Backed by our efficient workforce, we are able to offer our clients Industrial Leaf Springs that is available in various specifications as desired by the clients. These precision-engineered springs are procured from the certified vendors of the market to ensure durability and quality. Further, our range find wide applications in various industries like automobile, automotive, chemical, pharmaceutical and textile. Capacity: Flat Section - Thickness upto 16 mm. Width upto 120 mm. Total Length - As per requirement. Materials: Maximum section 100 x 120 mm. approx. Conforming to IS:3885 Pt.I Gr.4, En-45, En-47. We also manufacture Leaf Springs from superior quality Leaf Springs. 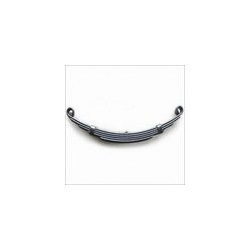 These leaf springs are preferably used in heavy commercial vehicles like vans, trucks, SUV's and railway carriages. These springs possess the the additional advantage of distributing the load widely over the vehicle's chassis. Based in Kolkata, we are Leaf Springs manufacturer, Leaf Springs exporters & suppliers of India, offering a wide array of industrial springs to our customers. Multi Leaf Springs is majorly used in the suspension process of wheeled vehicles. It is a simple form of spring, that is produced from various stacked leaves in several layers.We manufacture these springs from spring steel flats. We are the most reckoned manufacturer, exporter and supplier of all kinds of industrial springs, offered at highly competitive and industry regulated prices. We provide these rust or damage free springs in safe and secure packaging services and on time delivery services that distinguishes us from others.